Browse our unique selection of Memorial Paw Prints. Let us help you create a lasting memory of your pet. An imprint of your pets paw is cast in clay. This stylish frame provides a unique way to display a paw print of your best friend. Available in mahogany finish. Create a simple and classic memorial of your pet in this table top framed display. A 5" x 7" picture of your beloved pet is displayed on one side and an impression of your pet's paw print is displayed on the other. Picture insert 5" x 7"
Create a truly elegant memorial to your beloved friend with this framed photo urn. Your favourite photo of your pet can be easily inserted. 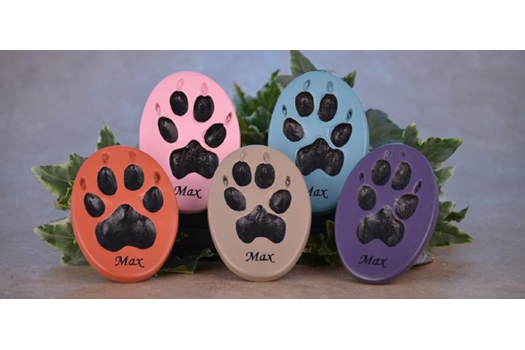 We will take a paw print impression from your pet and insert this is the display area. (Pawprint at extra cost). You may wish to place your pets urn inside with any special mementos such as tags, a special toy, etc. An optional brass name plate can be added to make this a beautifully, personalized memorial. Sizes 10 1/2 W" X 7 3/4 H " X 6 1/2 D"